Early provisional statistics for April (1st-26th) show that overall it has also been a sunny and warm month so far compared to the long-term 1981-2010 average. Following on from the mid-month statistics, Middlesex remains the driest historical county with 2.7mm of rainfall so far this month just 6% of the long-term average for April which is 45mm. In comparison Sutherland has so far been the wettest historical county with 130.8mm of rain, 41% above the expected monthly rainfall. 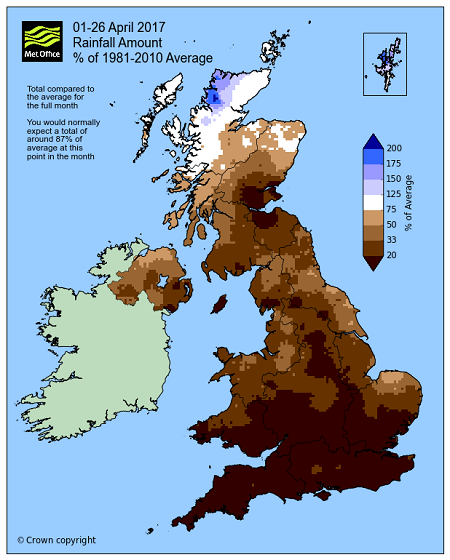 The UK as a whole has seen just 41% of the average April rainfall; the wettest region has been Scotland with 62.5mm and the driest southern England with 8.1mm. It is likely many of the rainfall statistics will change as we expect an area of low pressure to move in from the south-west over the Bank Holiday weekend. As a weather front pushes eastwards across the UK on Sunday and Monday, we could see 10-15mm of rain in some areas, especially in the south-west. Read more about this weekend’s weather in our latest news release. Despite the recent low temperatures, with the coldest night reaching -6.2°C (Cromdale, Moray 18 April 2017), April has also so far been a warmer than average month. On 9 April 25.5°C was recorded at Cambridge, the warmest day of the year so far. 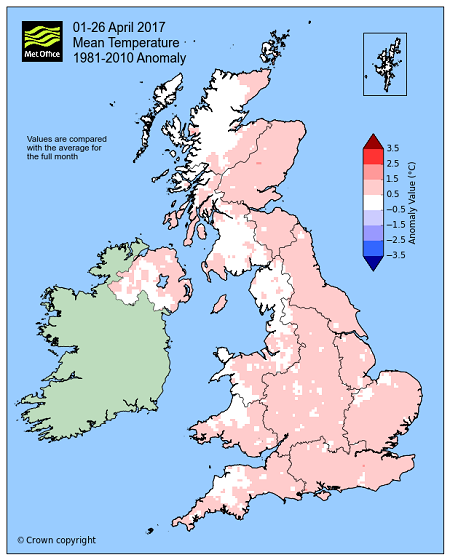 Overall the UK mean temperature has so far been 0.6°C higher than the long-term average. The warmest area against its long-term average was in Scotland, with Forfarshire recording 1.1°C above its long-term monthly average. Nearly all of the UK has already had the sunshine we would expect for the whole month, and there are still several days left to include in the statistics. Only Scotland and Northern Ireland are below the average with 88% and 63% respectively. The UK as a whole has already reached its monthly average with 148.4 hours of sunshine. The district with the most sunshine hours is the south east and central south of England with 188.3 hours of sunshine, 11% above the April average. This entry was posted in Met Office News and tagged dry, England, forecast, Met Office, rain, rainfall, record, spring, sunshine, temperature, weather, weather forecast, weather forecasting, wet. Bookmark the permalink. In the precipitation and sunshine column, I think instead of “diff to average”, it should be “% of average”. As it stands, if I am to interpret the table consistently across the columns, looking at England for example, it says that temperature was 0.7% above average, sunshine was 110% above average and rainfall was 20 % above average, when it should be that temperature was 0.7% above average, sunshine was 110% of average and rainfall was 20 % of average. All I was trying to tell you in my comment was that you’d made a typing error. I think this proves you automatically delete anything from me. The Met Office is not giving anything away for free I’m afraid. The Met Office is funded to the tune of ~£170 million each year by UK taxpayers, and in return it maintains an observing network and produces forecasts, warnings and climate statistics like these for the citizens who pay for it. You could argue that the benefits of the forecasts and the warnings of severe weather actually outway the cost, which they more than likely do. But try getting more detailed climate statistics from them, and you will find that a bespoke services like this is far from free.